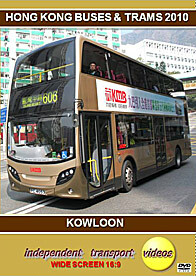 According to the Across website , Kowloon Motor Bus fleet no AAU1 was registered today as PU4458. Is this the first of the Alexander Dennis Enviro200s? 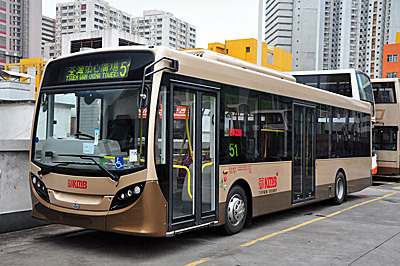 On the subject of new KMB vehicles, I understand that there are presently over 70 new buses parked in Hong Kong awaiting registration. 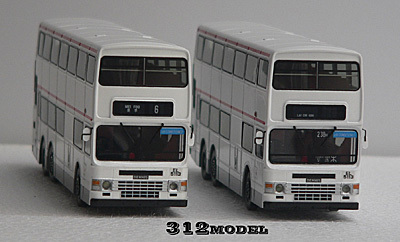 The 80M Bus Model Shop website has details of the Kowloon Motor Bus Volvo Olympian AV1, two versions of which are set for release in Hong Kong on 5th April. 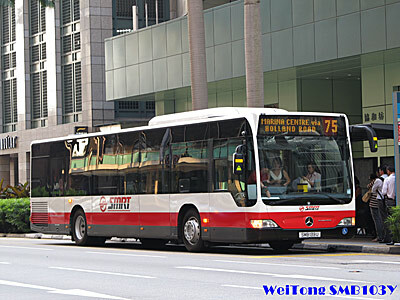 Further information and photographs of the new SMRT Buses Mercedes-Benz Citaros have tonight been added to the section of the site. I have today received confirmation that the total quantity of both resin KMB Dennis Dragons from 312/P&T Model (B0036) is 400 pieces. The new Citybus Scania is confirmed as being a type K280UD6X2EB and not a type K310UD as previously reported. 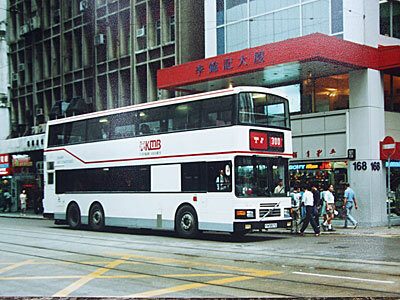 A new page has tonight been added for the two versions of KMB Dennis Dragon AD1 (B0036), which are now believed to be available in Hong Kong. A new page has tonight been added for the KMB driver training Dennis Dragon mentioned in yesterday's news (M3N03). Issue No. 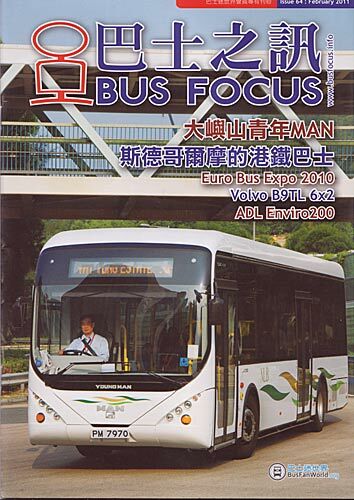 64 of Bus Focus has now been published by Bus Fan World and this issue features 78 colour pages covering all the latest bus news (Chinese text) including some excellent shots taken at the Euro Bus Expo 2010, an article on the two Wrights bodied Volvo B9TL with Citybus and KMB, plus lots more. A new page has just been added to the section of the site for the Citybus Scania K310UD pictured above. My thanks to Dennis Law for providing these photographs. The acquisition of a widescreen laptop has highlighted a problem with the left-hand gradient tint featured in the pages of the site, especially when it repeats itself across the screen with the wider screen sizes. As a result I intend to remove this gradient tint, leaving the pages with a plain white background. 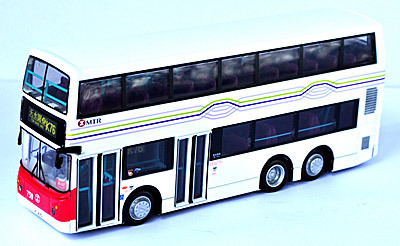 Venus Collectibles are to set release, on 30th March, a new 1:76 scale diecast model of Alexander double decker Dennis Dragon (M3N03) featuring white KMB Driver Training Bus CW5424 livery. The production quantity is 119 pieces with retail price of HK$349 each. Each model will have its numbered certificate and water decal as usual. 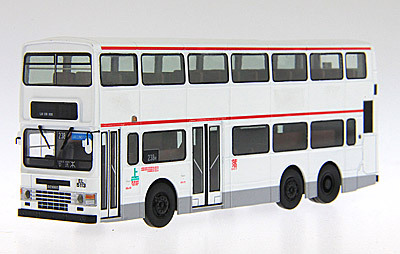 The Driver Training Bus CW5424 is a conversion of 3N3 (carrying its unique grille details as 3N3) after withdrawal from normal bus service, with some changes such as the removal of all seats on the upper deck and some seats at rear of lower deck, addition of mirrors, addition of Learning Signs, etc, that appeared on this model. 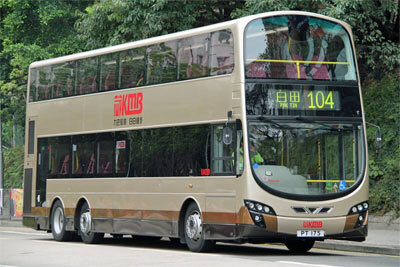 My thanks to Grant Ng Kwok Kuen for allowing me to use his photograph of the Citybus Scania K310UD. 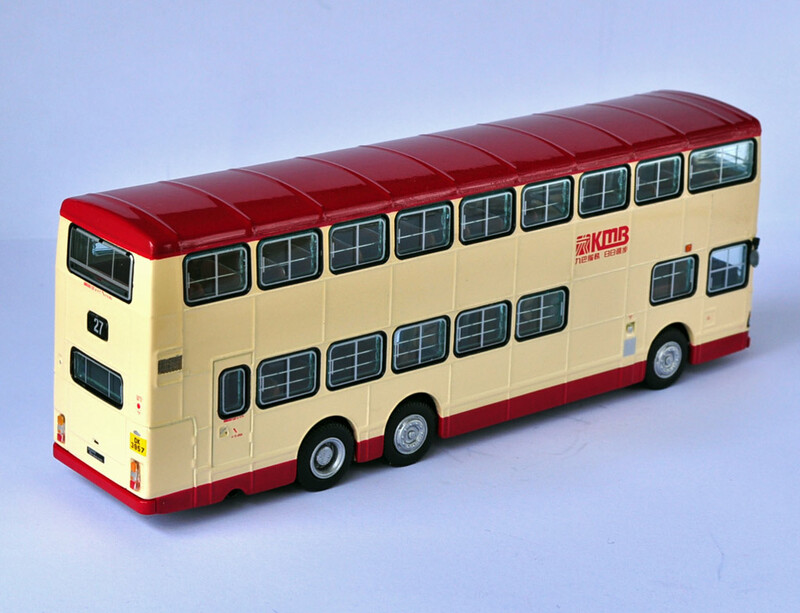 A new page has just been added to the 'Trams' section for the recently released 'Hong Kong' liveried example (TT33664) from 80M Bus Model Shop. Just a reminder that with the current issues surrounding Fotopic, all of the links to these sites in the 'Links' page remain unavailable. Yesterday's unconfirmed report of the release of two MTR Dennis Tridents has today been confirmed. 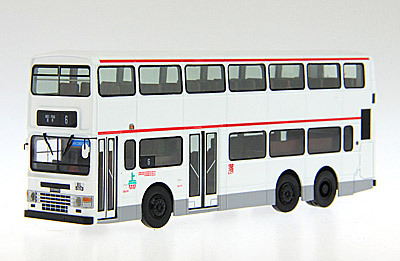 Produced by 80M Bus Model Shop, both models feature fleet no. 730 (JF1475) - model no 38705 is on route K51 to Fu Tai whilst 38706 is on route K76 to Tin Shui Wai. Each version is limited to 1,250 pieces and is expected to retail for HK$313. New pages and additional photographs have now been added. 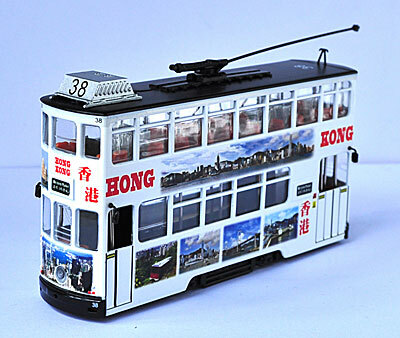 Released yesterday in Hong Kong is the above tram from 80M Bus Model Shop (TT33664). 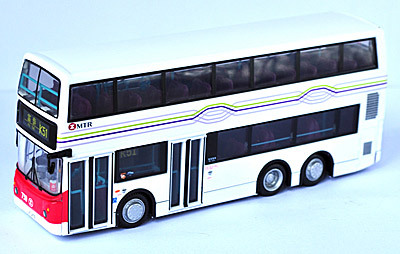 It uses the new 80M casting but carries the same livery as model TT33653, released in September last year. It retails for HK$198. A new page and further photographs will be added shortly. 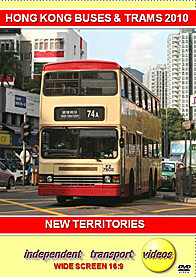 I have received an unconfirmed report that two MTR 10.6m Dennis Tridents are to be released on Monday 21 March, route numbers K51 & K76, unknown destination and unknown quantity for each. 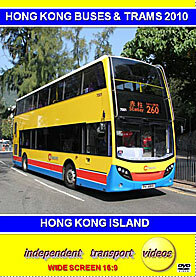 independent transport videos has released three new Hong Kong DVDs, all filmed in November 2010, which cover Hong Kong Island, Kowloon and the New Territories. Full details can be found on their website, just follow the link. My thanks to Dave Rogers for sending me the above photograph of KMB's soon to be modelled Volvo Olympian AV1, which he took in June 1994. Showing off its Gorba destination is recently delivered Wrights Gemini 2 bodied Volvo B9TL fleet no. AVBWU57. 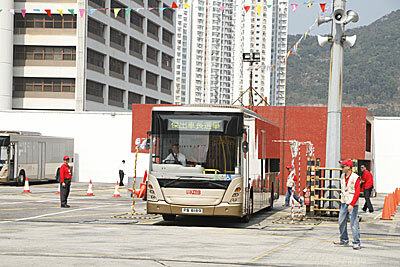 It is pictured at Kowloon City Ferry Bus Terminus. Larger photographs have been added to the section of the site. The online edition of KMB Today confirms the forthcoming release of two versions of Volvo Olympian AV1, as reported on 13th March. 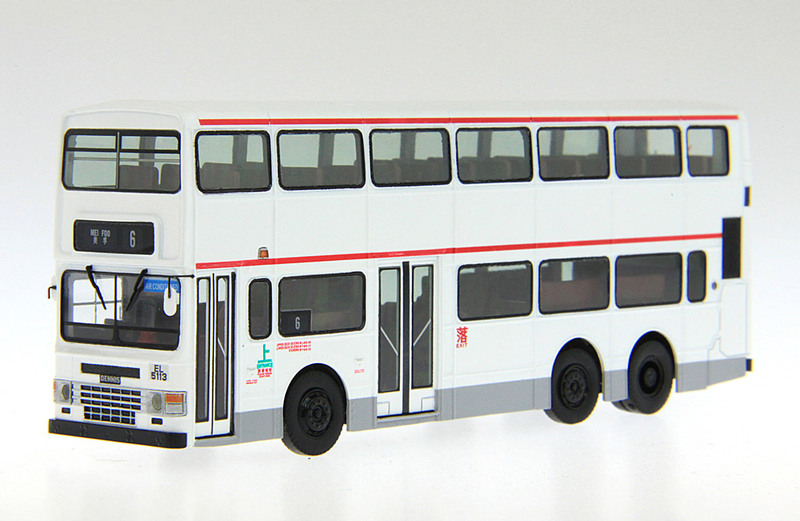 312/P&T Model has announced the planned release of two resin versions of KMB Dennis Dragon AD1. That on the left is on route 6 to Mei Foo whilst that on the right features Lai Chi Kok in the destination box and route 238M and Tsuen Wan in the nearside windscreen - a nice touch! New World First Bus continues to receive new Enviro500s, with fleet no. 5525 being the latest. Photographed on 11th March is 5523 (PT3487) on route 2X to Shau Kei Wan. My thanks to Vincent Chong for sending me this together with some shots of 5522, which have been added to the section of the site. 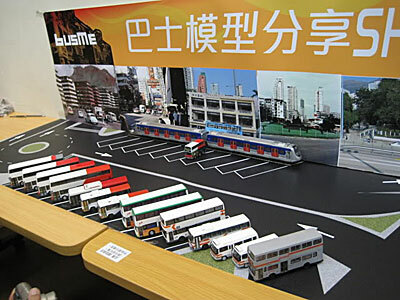 The third Bus Model Sharing Show will be held on Sunday, 10th April at the Ngau Chi Wan Civic Centre, Kowloon, next to Choi Hung MTR Station (tickets cost HK$35). 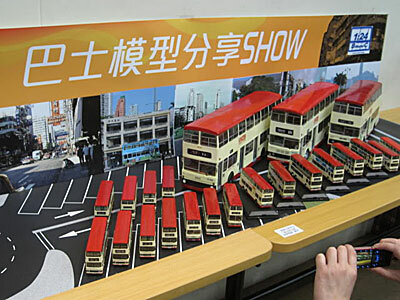 It is an exhibition/model bus rally where visitors can bring their own DIY bus model collection, share their DIY experiences and take photographs. Pictured above are some photographs of last year's event, more of which can be found here. 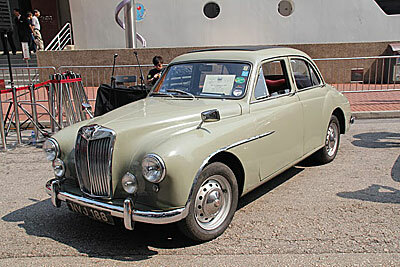 Whilst nothing to do with buses, an MG charity car show also took place yesterday in Whampoa and pictured above is one fine entrant. I am sure I speak for all visitors to this site in saying that our thoughts and sympathy are with the people of Japan during this difficult time. 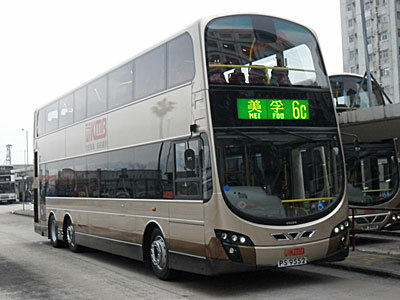 Believed to be the next Kowloon Motor Bus model release is Volvo Olympian AV1 (FW5572). Two versions are expected, one on route 300, which is limited 1,000 pieces and the other is limited to 800 pieces. No other details are presently known. Kowloon Motor Bus held their annual Bus Captain of the Year competition today and thanks to Dennis Law, a selection of photographs has been added to the section of the site. 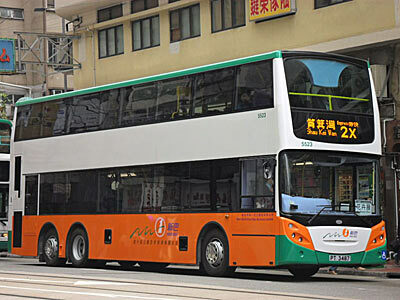 Several new photographs of KMB's Alexander Dennis Enviro200s and twin axle Volvo/Wrights have been added to the section, thanks Grant Ng Kwok Kuen. My thanks to Eric Leung for sending me some photographs of several of the WJB trams previously missing from the site. These have been scanned from an Automobile magazine dating from, I believe, 1992 and include trams carrying adverts for CSL, Herald Tribune and SAA. Special thanks also to Vic Davey of the West Wales Museum of Childhood, Langeler for allowing me to use his photos. New pages have been added to the Trams section. My thanks to Philip Chan for sending me several photographs of the recent additions to the KMB fleet. I have just added a couple to the section of the site - more can be viewed on Philip's Picasa Web gallery. 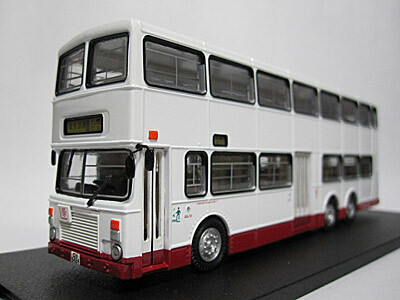 Cars Workshop has allocated product codes 92601 and 92602 to the two new KMB Dennis Dragons set for release on Sunday. New photographs have now been added. 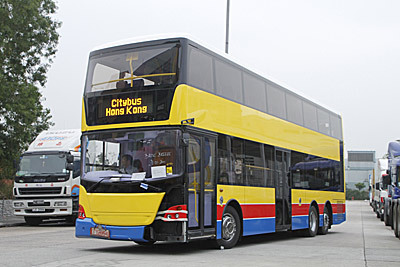 Hong Kong Transport Society has confirmed that their 20th Anniversary bus model, featuring Citybus 186 (FC4750) in the early 1990s livery, will be released in April. Priced at $318 each, the total quantity will be 1,000 pieces. Also, for some "yet to be discovered" reasons, T2 has been re-registered from DS8288 to PS6548. My thanks to Dennis Law for the above news items. 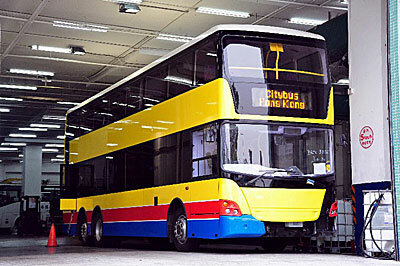 It is believed that the two Kowloon Motor Bus Dennis Dragons from Cars Workshop are set for release on Sunday (6th March).